Talk to workers in any sector, in any workplace and sooner or later they’ll get to their frustrations with their ever-increasing workloads: “I’m struggling,” they’ll lament to fellow workers or anyone ready to listen, “to just do the job, never mind do it well.” And yet even though few work-related issues seem to generate more passion, the relentless intensification of every-day work life rarely surfaces as a union priority. Why? To be clear, it’s not that the pressures of work never surface at conventions or during bargaining. Rather, it’s that they are never given any primacy. Delegates speeches on this from the floor, animated as they are, seldom go beyond exasperated workers letting off steam. The resolutions introduced from the platform and duly passed are not connected to actually doing something effective about the problem (a cynic might say they are actually intended to be only symbolic). And even when the issue of workloads reaches the bargaining table, accompanying mobilizations and public campaigns are at best lukewarm. Usually the demands are quickly and quietly dropped; when they are addressed, it is in a collective bargaining language which leads directly to bureaucratizing workload complaints without solving the underlying problem. If unions can’t affect something as basic as the daily oppression of overwork and its link to injuries and constant physical and mental exhaustion, it’s all the less likely that they can develop member confidence in broader collective action. In fact, giving the workload issue the priority it deserves and dealing with it effectively presents great strategic opportunities for renewing the labor movement as a whole, including by linking up with precarious and unemployed workers, and mobilizing working-class communities more broadly around the fundamental questions that increased workloads raise for our whole society. At a time when each union is so absorbed in their own specific issues, workloads introduces a concern that touches all workers, holding out the prospect of some badly needed cross-union solidarity. Precarious workers are especially vulnerable to workload pressures: if unions can show that something can in fact be done about workloads, it opens further organizing potentials. And as shown by the recent New York Times exposé of the high-pressure working conditions at Amazon, this is also an issue of great concern even for the relatively high-paid, high-skilled information technology workers as well as for the low-paid and precarious blue-collar warehouse workers. Unions taking on workloads can also lead to securing support from the unemployed. If unions can explain that when management forces five workers to do the work of six, this means overwork for some and no work for others, this can counter the way the desperation for work is often manipulated against the employed. At the same time, the heavily increased workloads in the provision of healthcare, education, and social welfare translate directly into the declining quality of services to the public. What better terrain for bringing together working-class frustrations on the job and in the labor market with working-class frustrations with the erosion of essential services in their communities? What greater opportunity to break down the false and damaging division inside the working-class between work life and social life? Why then are union leaders not leading on this issue? Why are they not seeing its potential for addressing membership demoralization, renewing labor institutions, building broader alliances, and contributing to an overall rejuvenation of the labor movement? And why are more members not pushing them harder to do so? The problem in fact goes beyond the myopia of union leaders and the answer will not be found in just blaming them for the maddening refusal of unions to act strategically. We need to dig deeper. To get a clearer handle on the problem, we want to first set out some historical background that helps understand what has made it so hard to address workload issues in our time, before turning to address why workers themselves have not revolted against their rapidly worsening workplace conditions. Then, after zeroing in on what “lean production” really means today in terms of workload, we will analyze the contradictions and divisions that emerge in unions even when they do address workload issues, before finally considering how union activists might get workloads seriously on the agenda again. Capitalism has a clear underlying logic: to create the most favorable conditions for the growth of profits and the expansion of capital (hence the name capitalism). For capitalists, labor power is a commodity like any other: an input to buy as cheaply as possible and then use with as few strings as possible. Unions emerged to mediate the price of labor power and to regulate its use via negotiating work pace, rest periods, health and safety, rules on transfers, etc. Unions consequently became a democratic counterweight — historically the most important such counterweight — to the narrow values of capitalism. In the labor struggles that followed the end of World War II, unions made impressive material gains and to some extent pushed for a more substantive economic democracy that included not only broadening and deepening the welfare state but also extending workers’ rights to control workplace conditions as well as extending public controls over capital. But a particular trade-off evolved that saw unions accept an emphasis on the price of labor power (wages and benefits) trumping workplace rights and also attempts to limit capitalist power over investment. This was accomplished by way of both the stick and the carrot as deployed by corporations and states. The small but effective militant Communist minority that agitated for more radical directions was harassed and many were drummed not only out of their jobs but also their unions. Legislation banned or restricted the right to withhold labor during the life of the collective agreement — labor actions that were generally about resisting increased workloads and degraded working conditions. At the same time, the more moderate working-class mainstream was integrated through state-sponsored programs that allowed for the spread of home ownership (lower interest rates and secured mortgages) and national insurance and welfare systems that provided protection against the worst vagaries of the market. Leave it to business to manage, the argument went, and we’ll compensate workers with consumer goods. In this way, post-war worker militancy was consequently channeled into the safer territory of individualized consumption. Union leaders so readily accepting the concentration on wages and benefits had two roots. Economically, it was simply the easier road to travel since corporations were ready to offer higher wages and benefits if their management rights weren’t seriously tampered with. Bureaucratically, the emphasis on worker compensation helped consolidate the status and power of the union leadership. 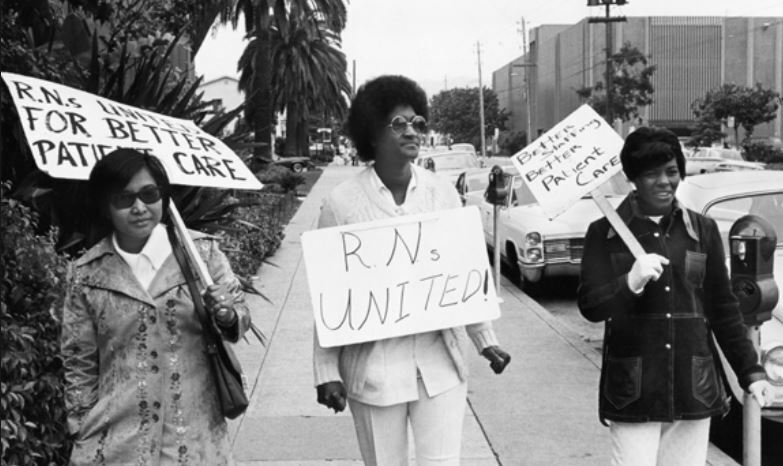 While wages and benefits were bargained centrally by the nationally elected leaders and their staff, influencing working conditions largely rested on the role of local activists and leaders. Even if better workplace language was nationally negotiated, by its very nature this could only be monitored and enforced by local militancy. So by biasing bargaining toward wages and benefits and narrowing the scope for resistance to workplace conditions (and often trading off workplace concerns for higher wages and benefits) union leaders firmed up their own importance and undermined alternative local bases of power and leadership. But why did workers tolerate the relative inattention to workplace conditions? In fact, the so-called “deal” referenced above was never complete. Workers continued to struggle against conditions imposed by management and this included occasional rebellions against their own central leadership. But absent a concerted response from their own organizations and a broader mobilization against the realities of corporate power, this resistance was gradually sapped. Central to workers’ post-war relegation of working conditions to secondary status — however reluctantly this happened in many cases — was the recent history of the deep and extended Great Depression followed by the deprivations of a war economy. These brought a natural desire for catching up to what had, in terms of consumer goods, been lost or postponed. This combined with a fatalism that set in over the possibility of doing anything significant about working conditions. That fatalism was based on the options workers faced which were structured in clear ways. They could challenge management rights, but corporations had made it clear that to do so would involve long, hard, and perhaps unwinnable battles. Furthermore, given the form post-war collective bargaining legislation had taken, the state, including the judiciary, would be on the side of the employer, making success even more uncertain. And perhaps most debilitating was the ambivalence (or worse) of unions themselves about their commitment to such struggles. It was one thing to emphasize the value of workplace rights; it was another, when faced with the above “realities,” to retain confidence in taking on the daunting risks involved. And so there was a drift toward an accommodation that marginalized the workplace as a site of struggle. Quantitative demands overtook qualitative demands. Getting something more rather than something different became the watchword. A culture of consumerism came to dominate, characterized not so much by the understandable urge to meet daily needs and enjoy life, but to do so in competitive and individualistic ways that sidelined popular possibilities for collectively shaping the world and sharing equitably in humanity’s achievements. As the circumstances that gave rise to the post-war boom faded and expectations of steady progress could no longer be taken for granted, workers and unions found that their earlier capacities to improve wages and benefits were no longer adequate to the new circumstances. Corporations and states demanded, in the name of competitiveness and restoring the profits that are the lifeblood of a capitalist economy, a lowering of both material expectations and intensified workloads. Though much of the labor reporting on this period revolved around monetary concessions, the corporations’ most important historical gains lay in their greater control over the restructuring of work, the combining of jobs, and old-fashioned speedup. The assault on workers largely succeeded. Insecurity became permanent, wages stagnated, working conditions deteriorated, and democracy was reduced to the question of whether any recommended changes were consistent with competitiveness. It might have been expected that with the system no longer “delivering the goods,” the legitimacy of corporate power, if not of capitalism itself, would be undermined. Yet rather than this leading to any kind of rebellion, most working families and unions again adapted to the new realities. This time, they offset their stagnant wages in ways consistent with, and even reinforcing, the prevailing ethos of individual survival. Families worked more hours (overtime for some, entering the workforce or moving from part-time to full-time or multiple jobs for others); debts were taken on and homes became assets to borrow on; stock markets were cheered on so as to protect pensions; young couples moved in with parents to build some savings. And, in the hope of hanging on to past lifestyles, workers tolerated even worse workloads. The radical shift in the balance of social power in favor of corporations and against the working class (what has been dubbed “neoliberalism”) was expressed inside the workplace as “lean production”. Lean production raised the inherent capitalist drive to reduce workers to commodities that were only valuable to the extent they created “value-added” for corporations to a new oppressive level. Its disciplinary arm was “management by stress,” which helped identify where labor power was not used to its absolute maximum, and labor was kept in line by the extension of a general sense of the precariousness of all worker’s jobs. Lean production wasn’t limited to the private sector. It spread as well to the public sector, impelled by fiscal pressures and the push to privatization. Governments began by restructuring services — “streamlining” the work and increasing workloads — so as to both reduce the number of public employees and to make the operations more attractive to prospective private-sector buyers. It is easy to see why even though corporations and the state demanded wage concessions, they were especially attracted to lean production’s increased workloads. With workers desperate to hang on to their family’s livelihood, the insistence on large wage cuts for all might lead to the kind of collective resistance that dividing workers might escape. But if the workforce is, for example, cut by 10 percent and the remaining workers pick up the slack, those who leave are consequently no longer a factor, and those remaining may, in spite of the increased workloads, be relieved to hold on to their jobs. A consequence of trying to organize workplaces on a super-lean basis with “no fat” was that it left corporations vulnerable to unexpected disruptions. So minimizing worker-led resistance to capitalist restructuring was especially important, and this required winning unions and through them workers over to a philosophy of “jointness” in managing these changes. Whether unions accepted this as a matter of having no choice or did it with illusions of winning certain favors (such as smaller wage cuts) this compromised the role of unions. Coupled with the demoralization that workers suffered in face of the restructuring without any serious fightback, this led to what might have been only temporary setbacks turning into longer-term substantive defeats. In workplaces with evolved collective agreements, job security protections make layoffs complicated and time-consuming for the employer and so serve to frustrate and discourage layoffs. In this sense these are the strongest workload protections in most contracts. But an increasingly common feature of many job security mechanisms is the exit package, which gives workers who might otherwise be laid off the option of a cash payment of a year’s salary or more in return for resigning. It has become typical that in unionized workplaces, workers come to assert — and are encouraged to assert — a form of personal property rights or ownership over their jobs, at least to the extent that they have the right to sell ‘their’ job for negotiated exit packages. In the private sector, this has meant giving up on mobilizing to keep work in the community, if not for existing employees than for future workers. As the public sector followed the private sector into lean production, the outcome was even more destructive. What public sector workers were selling in accepting job loss was not only community jobs but the level and quality of community services. In doing this, the public sector unions break faith with the public — their key potential ally if they are to ultimately defend themselves. However much these unions might try to position themselves as the leaders in defending social services, accommodating to the reduction in services in exchange for packages for their members undermines that crucial strategy. Restructuring and reducing the workforce is therefore not only a matter of the collective loss of work and security or the loss of mobility into once-favored jobs, but the redistribution of the work onto a diminishing pool of workers. This volume of work causes high rates of injury and stress. Despair at this breaks down solidarity on the shop floor and pits workers against each other. Furthermore, many employers have come to use lean production processes to co-opt workers in the process of identifying “redundant jobs” which are then eliminated and the work then redistributed to a smaller workforce. The savings are large, especially when the employer and the state also work together to deny workers injured on the job their proper compensation for the human costs of the impossible work norms imposed by the restructured work process. In workplaces that have been facing years of ongoing downsizing (a common reality today) the administration of layoff protections has often become routinized, reinforcing trends to relations between employers and unions becoming relatively collegial in spite of the attacks on workers. The process of restructuring is effectively reduced to the technical question of dealing with “redundant” workers as quickly and efficiently as possible by placing them into other jobs or buying them out. When this happens the union has effectively moved from being an antagonist to the employer drive to restructure the workplace to becoming an ally. And where an individual otherwise faced with layoff receives a large cash payment for giving up her job and leaves, everyone seems happy. The employer has restructured and the union has, given the circumstances, effected with minimum effort a reasonably positive outcome for the individual worker involved. With such deals being worked out, local union leaders see little reason to make workloads into a real priority in collective bargaining. These deals reinforce the notion that individual workers own their jobs and can dispose of them as though they were their private property. What this involves is a transaction that is in fact selling in perpetuity both the job security and the future job prospects of fellow workers, even for other bargaining unit members — as well as the permanent shift of the work in the lost positions onto the remaining workers. Moreover, the person with the cash package has no responsibility to the workers who are injured as a result of workload increases or are permanently disabled and ruined financially. The broader public also feels the harsh impact of this narrow transaction. In the hospital sector, for example, the privatization and sale of individual parts of the work process — reduction of nursing or cleaning staff, for example — also diminish patient care. The patient is not part of the transaction but is nevertheless directly and adversely affected. The viability of the service and the collective worker concern to keep the positions depend on the support of the public, but that support is undermined by the individual sale of jobs that support patient care. The subversive notion of job ownership by workers undermines class solidarity and an understanding of their work as having a collective impact and being a collective responsibility inevitably also linked to the collective responsibility for workloads. As neoliberalism, lean production, and the collegial relationship between union officers and employers in dealing with downsizing sap class-consciousness and solidarity, the political parties that labor embraces have quite generally moved away even from traditionally moderate social democracy. Union activists are left on their own, without meaningful political direction, in a world where capitalism is highly organized and aggressively on the offensive. What then might be done to place workloads seriously on the union agenda as part and parcel of bringing the labor movement to life again? The obvious starting point is collective bargaining and the need to make workplace standards and enforcement mechanisms a top bargaining priority. Although this seems unlikely as a general union response, two or three of the more farsighted unions might take this up. If those two or three unions grasped the potentials of the workload issue and placed it at the center of their bargaining focus — as have those in the education sector by linking class size and staff workloads to the quality of classroom teaching and school life — it might inspire workers and activists to push for the same within their own unions. If such a struggle around workload does emerge, it can’t be separated from the rest of bargaining, but would have to be positioned as an integrated and leading part of the overall bargaining program. For example, if the union fights to limit part-time workers but is unable to lift corporate caps on hiring full-time workers, workloads will increase. If more time off is negotiated but the issue of replacement workers is ignored, the remaining workers will just end up working even harder. If seductive buyout packages are still used as the easy out to deal with cutbacks in the workforce, this would only further diminish the paid work and available services that the community needs. Moreover, local unions will need to become much more central if workloads are to become a key priority for the labor movement. In contrast to wages and pensions, the actual enforcement of job rules and standards secured in collective agreements is much more dependent on what happens locally. It is tempting for local leaders to give up job rules and standards not just for the promise of jobs but for other special favors management could dole out that might, among other things, affect the electability of current leaders (e.g. flexibility in leave time, favoritism in hiring family members). This can undermine other sections of the union and it reinforces a culture antithetical to union principles and the worker solidarity that is the working class’s most important weapon. This makes getting and keeping the locals on side absolutely critical in union struggles around workload. Though the struggle over workloads has to be started in workplaces and partial gains can be made at that level, winning this battle requires changes beyond bargaining. For example, as Ontario’s population grows and ages and public demand for services consequently increases, the healthcare sector has experienced a decline in the workforce and the number of hospital beds. The province now has the fewest beds and staff relative to patients among the developed and larger developing countries and this has led to a fall — driven not by need but by rationing — in the length of hospital stays. Ontario hospitals now need increases of some 5.8 percent annually to meet costs, but the five-year funding freeze means they’ll face cuts in real terms of more than 20 percent over that period. Unless this is changed, the alternatives are either massive worker concessions or a combination of massive layoffs, cuts in services, and increased workloads. The unions involved cannot ignore this constraint; focusing only on their own needs will inevitably isolate and ultimately defeat them. The only solution — here as well as in the rest of the public sector — is to mobilize for the larger struggle to not only maintain but improve and expand services, with decent wages and working conditions being part of the quality of the services. If workers are to expand the options they face rather than see these options steadily narrowed, it means taking not just a sectional perspective (impact on union members) but a class perspective on what must be done (emphasizing the impact on all working people). The increased pressures on all working-class families creates, as we’ve emphasized here, a myriad of opportunities to join with other working-class families on this issue. Care and workloads in the hospital sector in Ontario cannot improve unless additional resources are leveraged for this service. This creates a nexus between the interests of the public and the workforce, and suggests that collective bargaining with quality patient care and workloads at its center could create the opportunity for a grand alliance between the public and hospital workers. We must however be clear that this fight won’t be won by unions simply asserting that they are “on the public’s side”; those who unions are trying to reach will question whether the unions are just being self-serving. Unions need to prove that commitment through their priorities and actions in bargaining, in the tactics they use during strikes, and on a daily basis. Unions must do no less than convincingly demonstrate that they are the leaders in the fight for social services. One useful step toward building such community links might be to form local outreach committees. But this itself implies finding new forms of organizing in the community. Unions might help fund and work with community members to form “community councils” that explicitly address the improvement and expansion of services. The links between major Ontario healthcare unions to the Ontario Health Coalition, including its community coalitions, is one form of such work that has proved vitally important. The community meetings of the Elementary Teachers of Toronto and CUPE 4400 are another first step in this direction. And if CUPW’s Caravan Tour to publicize opposition to the end of home delivery leaves behind such worker-community councils that would be a major advance. All the talk of “alliances” will however not be meaningful if unions aren’t able to mobilize their own members. Education around austerity, its impact, its nature as a class struggle, and examples from struggles elsewhere is of course critical. A spur to this might be to undertake worker inquiries on workloads. Local executives and stewards would distribute questionnaires to their members asking how workloads have changed over time; which jobs have been most affected (and might therefore be specifically targeted for improving); the impact on health and safety, stress and exhaustion; how workloads have affected relations among workers and life outside of work; the effect on the number of jobs; the implications for the quality of the product or services provided; and so on. The point would be to get workers talking about workloads, documenting the issue for public dissemination, strategizing over how to generate momentum around the issue, and pushing their leaders to act more aggressively. Locals might establish or designate workload committees to facilitate the work of the worker inquiries. But since in most locals, activists are already overstretched, unless unions can engage in actions that generate bringing new activists into their circles, there just aren’t the bodies around to accomplish much of what might be done. Workload committees might be a catalyst for generating such new activism and potential new leaders as a first crucial step toward reviving the local as a fighting organization. Such initiatives from below have erupted in other moments of crisis in the labor movement. They can happen again. As important as it is to emphasize contract language, we need to also recall the historical role of direct workplace disruptions in defending workers’ work lives. Much of that spirit and the skills and tactics developed in those workplace disruptions have disappeared over the years of labor defeat; without their revival it is unlikely that the issue of workloads will, to the extent necessary, get on the agenda again. Such a revival might mean direct workplace action as part of a political campaign to ramp up corporate and state’s payments to workers injured on the job as a way to force some financial sensitivity in their decisions on the costs borne by workers. Or it might mean refusing certain workloads because they are in fact hazards to workers’ health. Engaging in work-to-rule to reverse harmful management decisions — so that workers only do what they are contractually required to do, and not do all those things they voluntarily do as a matter of common sense — has historically been an especially creative response to workload issues. And unions might also try to carry out a strategy of work-ins, where workers from various shifts would all join together to demonstrate how services could be improved if there really were enough workers to provide the service properly. The malaise in the labor movement makes it difficult to imagine a labor movement on the rise again whether in the workplace or politically. Unions are floundering, electoral politics seems to matter so little. Yet working people really have no option but to take on the struggle. The basic lesson of their long history, reinforced by the experience of the last three decades, is that fighting back always matters. Do nothing and things are guaranteed to get worse. Wait for a magic moment and you’ll wait forever. Only when workers engage in battle can victories come, even if small, and only through such struggles are the capacities and solidarity built to eventually enlarge these achievements. Putting the focus on workloads is, of course, only one of many ways to address the labor movement’s malaise. Certainly an important indirect outcome of a serious focus on workloads might be that of bringing previously unreachable precarious young workers into unions. But again, this is not a matter of abstract promises about unions fixing their workload problems; it would only touch a nerve if these workers saw unions taking on these battles and achieving some successes. And this points the way to a broader conclusion. If workers don’t respond as a class to the class attacks upon them; if they don’t use the tools they have as producers of society’s goods, services (and profits); if they don’t build the class as a confident and creative social force with a vision that goes beyond “competitiveness”; if they don’t change their unions accordingly and if they don’t develop new organizations and begin developing socialist parties oriented to supporting workers ideologically and coordinating a militant response to the challenges workers face and to the end of not just modifying but transforming capitalism, then one conclusion follows. The working-class will be condemned to watch passively as everything around them gets uglier and uglier: the gross inequality, the wretched state of democracy, the perversion of human values, the environment — everything. There is, to invert Thatcher’s infamous slogan, no alternative but to organize and struggle.